From the border of Oklahoma to the border of Missouri, Route 66 crosses Kansas through Cherokee County in very southeast Kansas. With only 13 miles in Kansas, the trip itself was quick. Bikers, be aware--Kansas doesn’t have a helmet law, but Missouri and Oklahoma do, so watch for those state lines! We started our Route 66 journey in Baxter Springs, a historic town that hosts not only the southern point on the Mother Road, but also a portion of the Frontier Military Historic Byway. The original “cow town” of Kansas, Baxter Springs holds a rich history, including a Civil War-era massacre by Quantrill’s Raiders, cattle drives, lead mining and being the home of the only remaining Marsh Rainbow Arch bridge on Route 66. Route 66 carried us through the southeast Kansas countryside. The road is marked periodically with painted “Route 66” signs on the pavement. While it may have once been clear and smooth, it’s now a county road with it’s share of bumps to be aware of on the back of the bike. From Baxter Springs, the route travels through Riverton (home of the Old Riverton Store). We weren’t the only ones that made a stop at this historic store; this was one of the stops on the research trip for the movie Cars. The film crew met a man that inspired the character of &apos;Mater. If you’d like to see &apos;Mater, keep on traveling down the road. Galena was our next and final stop on Route 66. 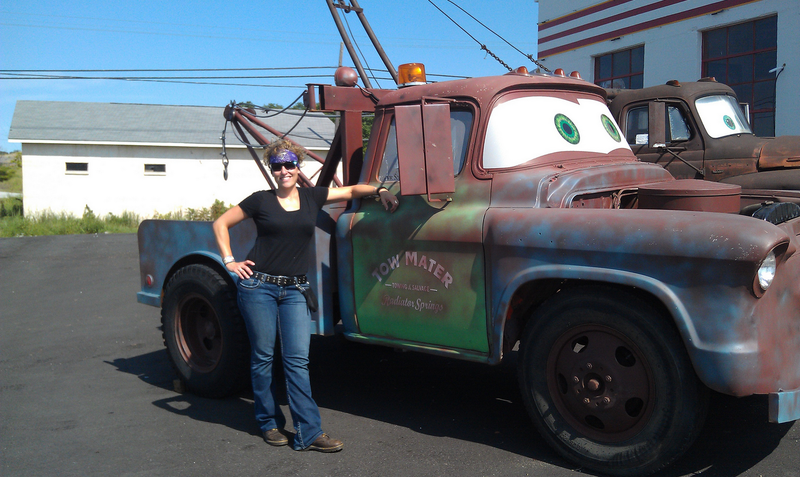 Here, we found “Tow-tater”, the 1951 boom truck that the famous Cars character was modeled on. Housed at “Cars on the Route”, Tow-Tater was a hot stopping point for quite a number of people as we were taking pictures. Throughout the downtown Galena area, the Mother Road has made its mark. Our new friends at the Streetcar Station were quick to share not only a great coffee but also local pride in all the hard work that’s gone into the revitatilization of this once booming mine town. A new tile mural was recently installed along the route in Galena, a privately funded project that is part of the build up to the International Route 66 convention that will be held in neighboring Joplin, with events in Galena, the first weekend of August 2013. Route 66 may have been the shortest ride we’ve taken on our byways adventures this year, but it&apos;s long on history and great places to stop. Make sure you take time for the Baxter Springs Museum, to tour the haunted Galena Bordello Mansion, and to take it all in as you “get your kicks on Route 66”. Sarah Larison lives and works in Holton. When she is not working in quality and risk management, Sarah is an avid reader, amateur gardener and loves to spend time in the kitchen with her chef&apos;s assistant, known to most as her daughter "Mini-me". A native of Manhattan, Kansas, Sarah loves to cover miles across the state either in running shoes or on a Harley Davidson Wide Glide with her partner-in-crime, Zeb. Discovering a beautiful view, a local dining experience or a great road to travel upon is a real joy to this riding team.